I haven't been feeling very well over the last few days, but I haven't made an outfit post in such a long time that I figured I may as well share my lazy clothes with you all! This outfit is probably my #1 go to when I'm feeling yuck, but I still want to look presentable. 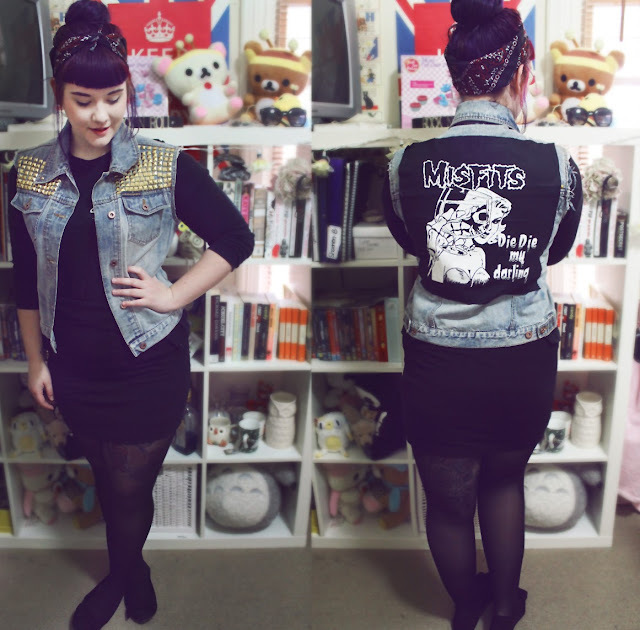 There's something about a studded denim vest that makes you feel so much tougher when you're not feeling great. You'll have to excuse my lack of colour, it's winter here in Australia and we're in the middle of a super freezing cold snap, and most of my warmest layers are black. I promise I'll be back with something a bit more exciting when it's a little bit warmer! What's your go-to outfit on freezing cold days? Love the vest! Did you DIY those studs? Wow! I did yes! They absolutely tore up my hands, too. I had to have month long breaks between each section I did, haha.